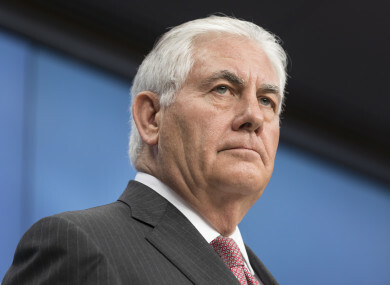 THE UNITED STATES is ready to talk to North Korea “without preconditions” but remains determined to force it to abandon its nuclear arsenal, Secretary of State Rex Tillerson has said. But even as Washington stressed the importance of a negotiated end to the standoff, Kim Jong-un vowed to make his nation “the strongest nuclear power and military power in the world”. In two public appearances yesterday, he warned that these efforts would continue until “the first bomb drops” and that Washington “simply cannot accept a nuclear-armed North Korea”. But he said the door to talks with Kim’s regime was open and left the opening wider than he had before, backing away from his former insistence that Pyongyang accept in principle to disarm. It’s not realistic to say we’re only going to talk if you come to the table ready to give up your program. They have too much invested in it. “North Korea’s actions are not good for anyone and certainly not good for North Korea,” she added. And Tillerson added that he would see it as a personal failure if his efforts came up short and US Defence Secretary Jim Mattis is forced to take military action to deny the North its arsenal. According to North Korea’s state news agency KCNA, Kim said his country “will victoriously advance and leap as the strongest nuclear power and military power in the world”. His latest boast came after the 29 November launch of the Hwasong-15 ICBM, a missile which the North claimed could deliver a “super-large heavy warhead” anywhere on the US mainland. Outside experts agree the rocket appears to have the range, but some are sceptical that Pyongyang has the technology to allow the rocket to survive re-entry to the Earth’s atmosphere. Trump habitually refers to Kim as “Little Rocket Man” and has threatened to utterly destroy his regime with “fire and fury”. North Korea has branded Trump a mentally disturbed “dotard”. In October, after Tillerson revealed he had open diplomatic channels to contact Pyongyang, Trump tweeted that his top diplomat was “wasting his time” trying to talk to Kim. Further inflaming tensions, in the last week, the US and South Korea launched their biggest-ever joint air exercise, despite calls from China and Russia for a freeze in manoeuvres. Email “Rex Tillerson says US ready to talk to North Korea 'without preconditions' ”. Feedback on “Rex Tillerson says US ready to talk to North Korea 'without preconditions' ”.